Professor Kevin Martin works with NIU students in the lighting lab. People are exposed daily to many different types of light. Although many are not consciously aware of the lights that surround them, the color and brightness of these lights affects them physiologically. Take a look around to consider the nearby sources of light. Is natural light filtering through a window? Is it sunny or overcast outside? Where is the sun positioned? Is there florescent overhead lighting, bright LED bulbs or soft light emanating from an incandescent desk lamp? Is a computer screen perhaps the primary light source in the room? How does light quality affect people? How can knowledge of light’s physiological effects on people to create environments that encourage effectiveness in workplaces and schools? How do specific light bulbs, light fixtures and settings affect energy consumption? NIU College of Engineering and Engineering Technology professors Kevin Martin and William Mills, in conjunction with the Department of Technology and the Institute for the Study of the Environment, Sustainability, and Energy, have worked to create a new lighting lab to explore these very questions. While some academic institutions on the east and west coasts have established lighting laboratories, no comparable research facility exists here in the Midwest. This is a void that NIU is hoping to fill. 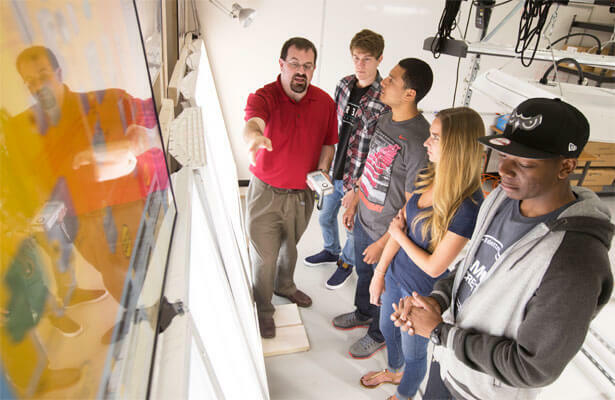 “The lighting lab at NIU provides an amazing hands-on link between the classroom and cutting-edge technology being developed and used in partnership between academic researchers and industry,” Martin said. The combination of energy efficiency and human factors is at the heart of the lighting lab’s research. A striking example of the physiology of lighting can be seen in lab’s three-paneled display. Each of these LED panels use the same amount of electricity but produce very different qualities of light that are perceived very differently by the human eye. The NIU lighting lab serves as a tool for research, as a teaching aid and industry collaborations. 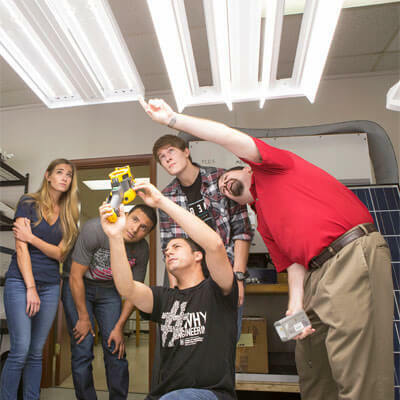 Working together, students and professors hope to learn more about interactions between the effect light on people and energy efficiency.